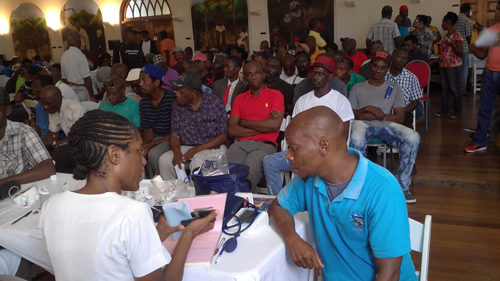 With prostate cancer being the number one killer among men in Jamaica, with an incidence rate of 72 percent per 100 thousand and the highest mortality rate in the world, hundreds of men from all walks of life, flocked to the Montego Bay Cultural Centre last Friday for free prostate cancer screening offered by the Jamaica Cancer Society, shrugging off the traditional fear of the Digital Rectal Examination. The free screening (Digital Rectal Exam, DRE, and the Prostate Specific Antigen, PSA – blood test) form part of the activities by the Jamaica Cancer Society to observe September as Prostate Cancer Awareness Month and were offered in conjunction with the National Health Fund, Cornwall Regional Hospital Cancer Support Group and sponsors. Shullian Brown, Fundraising and Public Relations Officer for the Jamaica Cancer Society said with estimates that 1 in every 10 men will be diagnosed with prostate cancer, it was heartening to see approximately 500 men being screened, but insisted she would love to see many more men coming forward. “Men start screening at a very late stage, despite it being the most prevalent cancer in Jamaica and with such a high mortality rate, not until they start having problems urinating; they go to the doctor and start having themselves examined. Prior to that, Prostate cancer – present with no symptoms, is the leading form of cancer in Jamaica; if men do not practice a regular screening regimen, they will miss being diagnosed with this disease,” Brown explained. She further explained that only 1500 men were screened for prostate cancer last year, despite the high incidence rate (the incidence rate is a measure of the frequency with which a disease occurs in a population over a specified time period), as opposed to more than 20,000 women being screened for cervical and breast cancer. Miss Brown said part of the JCS’ responsibility is to encourage the men to ensure that they have themselves tested continuously as a means of preventing and or treating the disease. Dr. Juanette Mason Jordan, retired consultant anaesthetist, who heads the Cancer Support Group at the Cornwall Regional Hospital, indicated that when the DRE and the PSA are complete, the men with abnormal results would be called to the chapel at the hospital for counseling and be recommended for treatment if required. “It is vital for men to have the test done to save their lives. We cannot stress this enough. Men have really come out and we are glad but more need to come to safeguard themselves, she implored. Odell Lewis, who is a prostate cancer survivor and who, along with Dr. Tasha Cooke, were instrumental in having the prostate cancer screening started in Montego Bay since 2012, says it is vital for men to have the test done to save their lives as it did his in 2006. “I had just returned home to Chicago from vacation in Jamaica in 2006 when during a routine test, I was diagnosed and the surgery was done in 2007 at the George Washington Hospital in Washington DC, USA. It was successful and here I am alive today, 11 years cancer free. My grandfather also died from prostate cancer. If I did not do the test I would have been dead by now. I volunteered with the American Cancer Society and then took my retirement and came here because this is ground zero for prostate cancer. Jamaica has the highest mortality rate in the world,” Lewis explained. Lewis said he is now living a healthier life eating natural foods and enjoying travelling between Jamaica and the United States.